We are pleased to introduce Pigasus Vineyard, our new source for Sonoma Merlot. 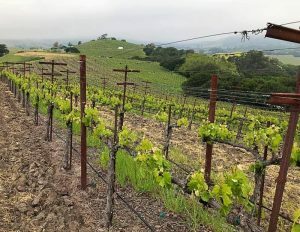 At roughly 850 feet of elevation, the family-owned Pigasus Vineyard sits in both the Bennet Valley (southeast end) and Sonoma Mountain (western end) AVAs. The 10-acre site is a beautiful rolling hillside plot on mostly volcanic soil. The climate is ideal, with warm days and cooling afternoon ocean breezes that allow for longer hang-time and strong flavor development. The vineyard was planted with Merlot clone 181, in 2000. Home winemakers can pick these grapes up in Sonoma at harvest or order them to be shipped frozen.